A lot of people have recently asked me why we’re stuck in this policy vise-grip, targeting spending cuts and deficit reduction when we should be targeting job growth. There’s no single perp here—there are numerous explanations, including politics and ideology of course, the changing views of the electorate on the effectiveness of Keynesian interventions, and the fact that normal people don’t readily do counterfactuals. By that, I mean we did the Recovery Act, and it demonstrably helped, but the unemployment rate still went up and hasn’t come down much. Independent analysts, including the CBO, make the case that the economy would have been worse without the stimulus, but good luck with that one in a climate where people really don’t want to see their much-needed, hard-earned income spent on stuff they’re sure is wasteful. It flies in the face of logic that in an economy like ours that’s operating significantly below capacity—like with 20+ million un- and underemployed—that cutting spending would help. But the argument got a lot of oxygen from an academic paper that’s been making the rounds (by Alesina and Ardagna—or AA), allegedly supporting the view that cutting spending isn’t contractionary, and can even be expansionary. My colleague Chad Stone has been taking on what he aptly calls the new voodoo economics (see this and the links therein). In his latest post, he reviews an important new paper (hat tip: SL) from the Congressional Research Service that explains how AA’s findings fail to support the idea that if we want to expand, we need to contract. Based on international evidence, AA claimed to find that “expansionary fiscal adjustments”—episodes of deficit reduction that led to growth—were largely driven by spending cuts. As you can imagine, this has a lot of conservatives in a deep swoon. Combine it with the Laffer Curve, and you’ve got the R’s complete toolkit: cut taxes to gain revenue; cut spending to boost growth. But alas, it doesn’t work. 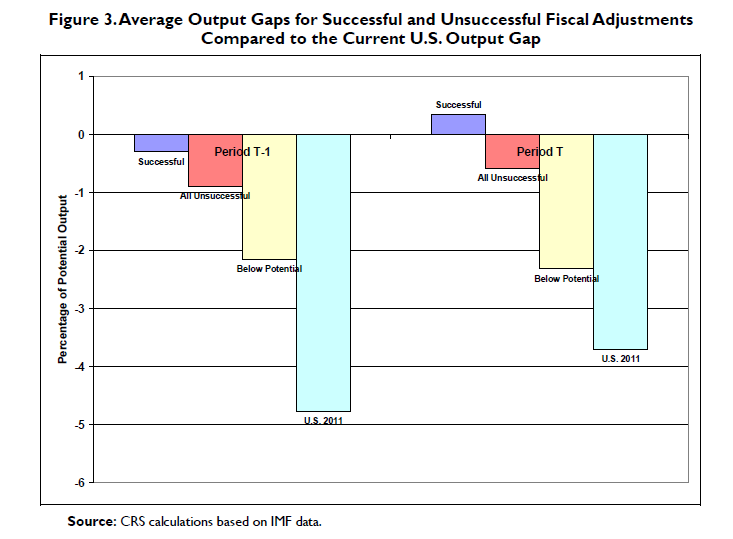 As can be seen from the CRS figure below, there is something quite unique in AA’s examples of “successful” fiscal adjustments. Period T-1 is the year before the adjustment (deficit reduction) and period T is the year in which it took place. What the figure shows is that the countries in the AA study deemed successful–where spending-based deficit reduction led to growth–lowered their deficits when their economies were pretty much back to full strength. The second bar (“all unsuccessful”) shows that if you tried deficit reduction when you were below full strength, it hurt your growth. And—drum roll please—even those unsuccessful adjustment were made in conditions FAR BETTER than where the US economy is right now. (See fourth bar in both panels; ignore the third bars). What AA actually find is that if your economy is healing—if you’re almost back to full employment—go ahead and start lowering your deficit. If you’re far away from full employment, do not screw around with deficit reduction. And we are very far away from full employment. Share the post "No Virginia, There Is No Such Thing As Expansionary Contraction"
6 comments in reply to "No Virginia, There Is No Such Thing As Expansionary Contraction"
The evidence continues to be compelling that a broad and large stimulus that will be spent rather then saved (ie directed to middle/low income individuals who would spend what they get, rather than additional upper income tax cuts or reductions in employer-paid SS taxes for cash-rich businesses) is the best path to helping the mass of Americans suffering through the continuing recession/depression, and provide the best long-term support for the country’s fiscal situation. I would suspect that there are very few serious policy experts who would disagree with this conjecture. However, we are in an apparently never-ending vice of fantasy-based politics (Gabriel Garcia Marquez for President, anyone?). The GOP detachment from reality has inexorably undermined America’s human and physical capital, and there does not appear to be a path out of this madness. In fact, the madness appears to be accelerating (for example, WSJ praise for the nonsensical Ryan medicare and Pawlenty budget proposals, gold-bugs and the persistent call for an end to “fiat money” in blogs and blog postings). As a liberal progressive, I feel almost consumed with frustration at the path this country is taking. Our politics, so far to the right of the country as a whole, are the worst I can recall in my 30 years living here. The actions of our congress and state legislatures appear fixated on supporting defense and attacking Planned Parenthood. Please Jared, tell me; Where is the anger? When (if ever) will it finally find expression? Do you assume real GDP should grow by the amount real aggregate supply grows? Thanks! I’m curious. It seems to me that the entire Bush period was an unacknowledged exercise in Keynesian policy. Large tax cuts, extremely high deficit spending, expansion of money supply all working to put money into the economy. Yet the economy really wasn’t all that great during that time, especially regarding job creation. Am I right? If I am right, does the Bush economic record somehow indicate a change of basic conditions that limit the effectiveness of traditional Keynesian analysis/actions? As I understand it, Keynes did not argue for large fiscal expansion under full employment conditions, when the economy is running near potential, which is where we were during the Bush years. Rather the opposite – he argued that under full employment, government spending should decrease and revenues increase, to pay down the government debt. Government spending and investment is the counterbalance to private spending and investment in the Keynsian view. Thanks! Embedded in post now.